Caring scrub with Mother-of-Pearl powder for legs and feet. 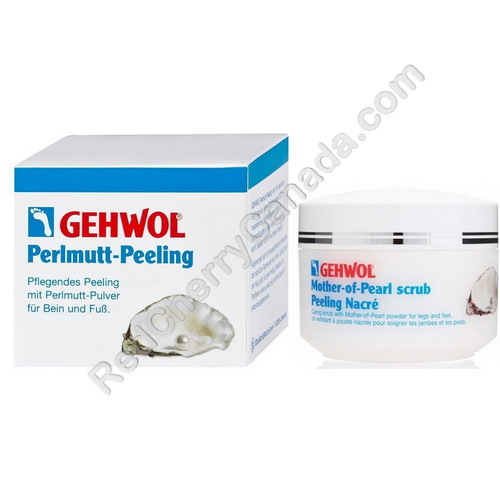 Gehwol Mother-of-Pearl scrub acts with valuable Mother-of-Pearl powder, fine sugar crystals and massaging wax balls. Nuisance skin scales are removed, the skin is gently massaged and hydrated. Algae extract keeps the natural skin barrier intact with sea water which is rich in mineral substances. Jojoba oil renders the skin smooth and supple, bisabolol and panthenol soothe the skin. Gehwol Leg Balm for dry or normal skin ideally completes the treatment. Application: Moisten the skin well before application, then apply the Mother-of-Pearl scrub and gently massage into the skin. Rinse well after exfoliation.